Not only is this beet salad gorgeous, it also has a delicious poppy-seed dressing that makes it sing! Then there’s the roasted hazelnuts, creamy goat cheese and fresh herbs that transform an earthy root vegetable into something simply glorious. I know that not everyone likes beets but when cooked right, and paired with the right things, beets taste amazing! What I also love about beet salad is that it is so easy to prepare. Yes, it takes time. Whole beets don’t roast quickly. But the total preparation takes mere minutes. 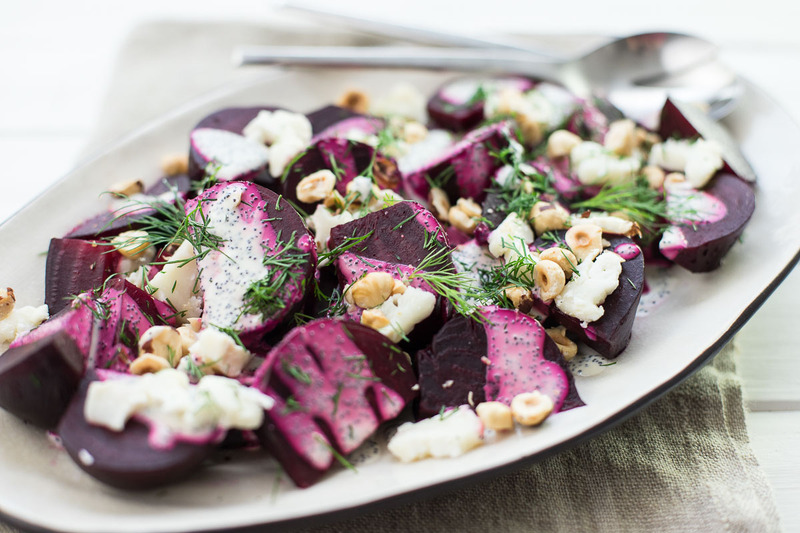 So yes, this beet salad is easy, healthy and delicious! It can be served as a side dish or meal all on its own, and can be served warm or cold. It makes a delicious warm side dish, served along with couscous, a chickpea salad or roast chicken. And I also think it makes a great cold dish which can be served as a delicious addition to weekend brunch. I recently watched a documentary about heavy metal. And when it comes to cooking or wrapping your food with aluminum foil, well basically we shouldn’t do it. The metal can leach into our food, especially when you cook with it. I rarely use aluminum foil, but there is one thing ingrained in me since my childhood. Roasting beets in foil. We had beets growing in the garden and so boiled beets, roasted beets and beet greens were a regular occurrence. And in those days we wrapped our beets in a double layer of foil, just as we did potatoes on the BBQ. So I am trying to be more aware and either roasted my beets already peeled and sliced, or if doing them whole, simply choose to use a casserole dish with a lid, or a Dutch oven works just as well for this type of roasting. The choice is yours, so I have included both methods for this beet salad. This beet salad is so good. I really hope you enjoy it is much as I do. Here’s to giving beets a second chance! A delicious and easy to prepare beet salad that fantastic served warm but can also be enjoyed cold as a healthy side dish. Season the beets with salt and pepper and tightly wrap them in a double layer of foil. Roast on a baking sheet in the middle of the over until tender when pierced with a knife, 1 to 1 1/4 hours (depending on size). Alternatively, coat the bottom of an oven-safe casserole dish or Dutch oven with olive oil. Place the beets in the a single layer in the bottom of the baking dish, season with salt and pepper and cover with a tightly fitting lid (or cover tightly with foil) and roast until tender, checking for doneness between 50-60 minutes. Remove from oven and let stand for a couple of minutes. Transfer the warm beets to a paper towel-lined cutting board, and use the paper towels to rub off the skins. Trim off and discard the root ends. While the beets roast prepare the dressing. In a small bowl, whisk together the yogurt, olive oil, mustard, vinegar, and poppy seeds. Season with salt and pepper, to taste. Slice the warm beets into bite-size wedges and transfer them to a serving bowl or platter. Season them lightly with salt and then drizzle the dressing evenly over them. Sprinkle with goats cheese, hazelnuts and fresh herbs. Serve immediately. It is also possible to steam the beets in the oven. Toss beets with oil in a baking dish; season with salt and pepper. Add ¼ cup (60 ml) water. Cover pan tightly with a lid or foil (so that steam will build up) and roast beets until a tender when pierced with a knife, about 60–75 minutes. I use Chevre goat’s cheese (without the rind) for this recipe. Store-bought roasted hazelnuts can be used for this recipe, otherwise roast the hazelnuts in a dry skillet over medium heat, toast the hazelnuts, stirring them to color evenly, until the skins char in places and begin to split and flake, about 10 minutes. Transfer the nuts into a clean kitchen towel and wrap the towel around them. Rub the nuts against one another inside the towel to remove the skins. Do not worry if some bits of skin remain. Transfer the nuts to a cutting board and chop coarsely; you want an uneven mixture of some hazelnut halves and some small pieces. 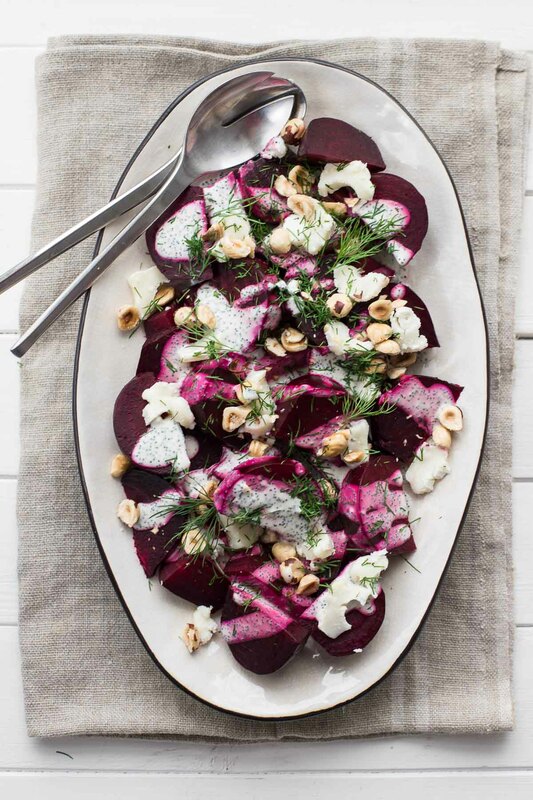 This recipe was inspired by Julia Turshen’s Beet Salad with Poppy Seed and Chive Dressing from her cookbook Now and Again. I’ve adapted the dressing slightly and serve the beets roasted rather than boiled and top them with roasted hazelnuts, goat cheese and fresh herbs. 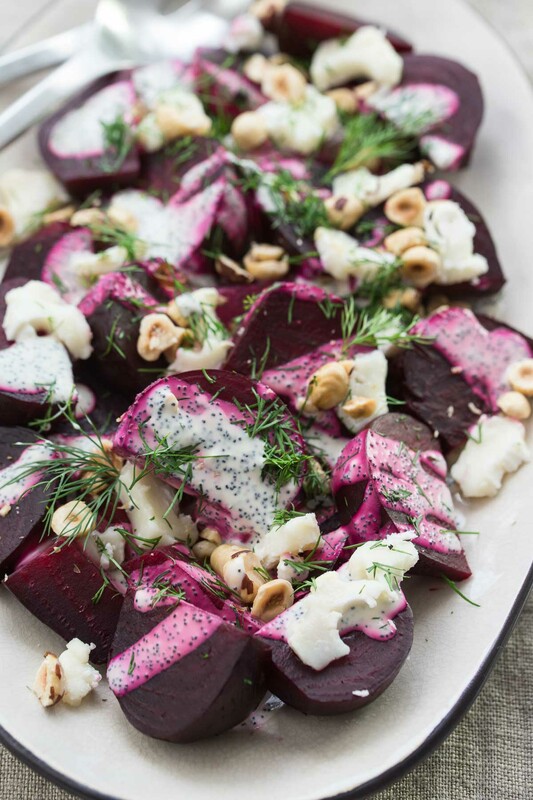 If you make this Beet Salad Hazelnuts, Goats Cheese and Poppy Seed Dressing recipe, I’d love to hear how it turned out for you! Be sure to rate it and leave a comment below to let me know! Especially if you have tips for other readers. Or take a picture and tag me on Instagram @ellerepublic and don’t forget to hashtag #ellerepublic so I don’t miss it!